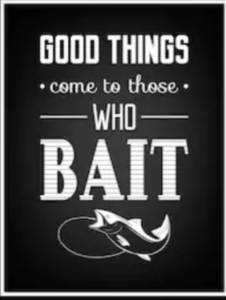 So… as a brick and mortar retailer what sort of bait are you using to catch your fish. I don’t know a lot about fishing but I know enough to say that you do your research before hitting your spot and use the bait that’s getting the action. Don’t consider what worked last time you were there either because it’s constantly changing. If it were me I would give some serious thought to bringing in some of the bed in a box guys to my retail floor, at least the ones that are spending the ad money. Off the top of my head Purple, Casper, Leesa, Saatva, and Nectar are getting it done with television and a strong approach to the internet with ad words, display and content marketing, so aren’t they the brands you should be advertising? Makes sense to me but there are a few problems with this. Not many of them are making a push into brick and mortar so you won’t have access to them. What if you just brought these products on to your floors to give consumers a comparison to what you are carrying in your store and set up a tablet on a pedestal for them to use should they want to buy one. Don’t be foolish about it either, don’t attack the product just let the consumer see what it is, and actually give them a way to buy the bed so that you’re not breaking any laws with your comparison. If you really do offer value then you should be able to overcome the e-commerce brands that are out there AND you give your customer a way to see those products in person. “Want to buy a bed on the internet? Fine, come on down we have some of the major brands in our stores for you to try PLUS our very own brand that will blow you away!” The Original Mattress Factory used to do a brilliant job of this and they killed the traditional brands as a result. Caught any big ones lately? Maybe you need to stop fishing with hot dogs. This is the very thing I have been saying for three years, but have found that retailers are scared to compare, and to advertise a brand they cannot sell profitably, missing the larger picture that you describe. Change is hard. I hope others read and consider your article. Most of these can be beat with better values and better service, but it is hard to bring the customer in to compare against a nebulous product with a great website, and a compelling story. The simple and timeless comfort test can win the day, especially when combined with real service and knowledge. Ken, thanks for reading and for the comment, I appreciate it! If a retailer is scared to compare this way, or doesn’t have a product that is good enough to compete then they have much bigger problems if you ask me. Their people should be good enough to convert that traffic into something on their own floor and if they aren’t, then they will need to find better people. That’s an interesting angle, it really devalues their return policy. They often thrive because they offer, “If you don’t like it, return it” which is a hassle. How about, “Come see if you like it, you might not, worth 10 minutes of your time and no cost”. Definitely worth the door swing! I like it! As a retailer, we have a mattress in a box on display, one that we can order and sell from a large name brand supplier and it hasn’t made a difference. In my opinion,the consumers that are purchasing the brands you mentioned on line aren’t walking in to a retail showroom to “shop” nor are they looking at our digital and print ads offering to let people “try it before they buy it”. We have found other “bait” to use to bring in consumers other than targeting the 10-15% of the mattress industry that will continue to purchase on line. Glad to hear you guys have found a good approach to that part of the market Jeff. I think that this segment of the industry is approaching 20-25% so I am simply saying if there is a big brand that has some pull, then having them on your floor could help capture a larger piece of that pie. If they don’t care about that on-line brand then it won’t matter, that is for sure. I think it is less about having a “bed in a box” and more about having the brand of bed in a box that they are interested in. Thanks for reading and for taking the time to comment! Mark, as a consumer it makes total sense to me. I’m not going to buy a car on the internet, same with a mattress. I guess I’m old school. If I could walk into a retailer and compare, I would be appreciative and even if I bought the internet mattress, I have needs in my home for more then one mattress so the retailer would have a leg up on my next purchase or additional purchases. No doubt Bill. I think if a consumer wants to buy a bed online they will do that but brick and mortar guys have to continue to find reasons to get them in their stores to shop. This could help create some pull. I’m with you, I would rather hit a store and give it a try especially when it comes to a bed! Thanks for reading and for the comment!